2016 Topps High Tek Baseball opts for quality over quantity but that doesn't mean the release is without a variety of collecting choices. Emphasizing acetate and various designs, each box includes one on-card autograph. 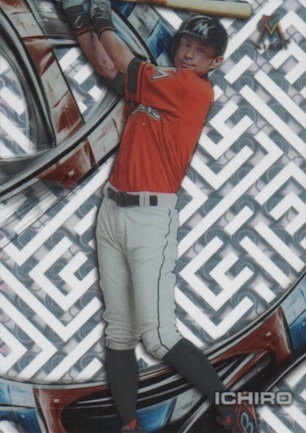 Like 2015, the base set takes center stage in 2016 Topps High Tek Baseball with a mix of parallels and multiple patterns. While the specific patterns will not emerge until release, parallels include Tidal Diffractor, Green Rainbow (#'d), Orange Magma Diffractor (#/25 - Hobby), Black Rainbow (1/1), Black Galactic Diffractor (1/1) and Printing Proofs (1/1). 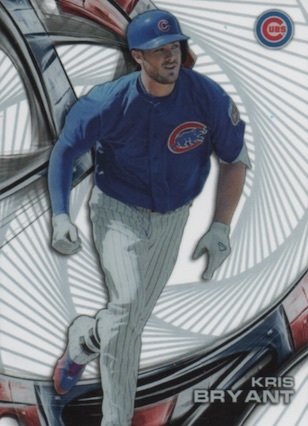 Collectors can also find Home Uniform Short Prints that differ from the base images and are each serial numbered. 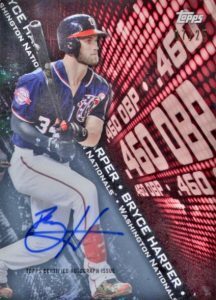 High Tek Autographs are the main hit option in 2016 Topps High Tek Baseball and offer a checklist of former greats, current stars and key rookies. Parallels include Gold Rainbow (#'d), Orange Magma Diffractor (#/25), Red Orbit Diffractor (#/5), Black Galactic Diffractor (1/1) and Printing Proofs (1/1). 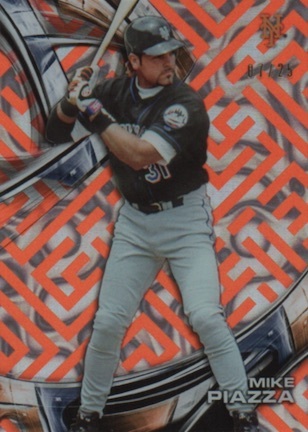 Looking back at the original run from the 1990s, Tek Buybacks (#'d) are found in limited numbers with original cards from 1998-2000 that have added on-card signatures. 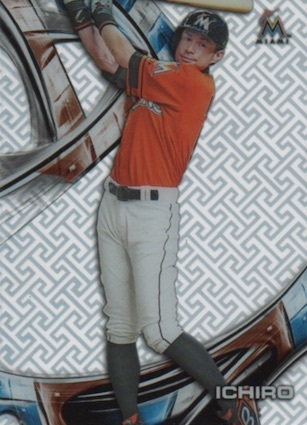 The only basic inserts in 2016 Topps High Tek Baseball are actually quite limited. 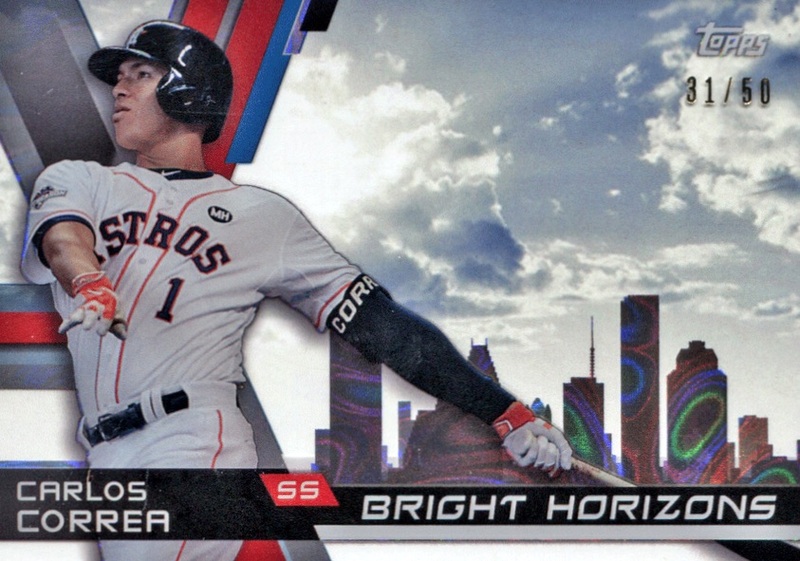 Bright Horizons (#'d) continue the 2015 insert with horizontal shot of the city skyline for notable players. Highlights (#'d) look to the top moments from the past and present. Both inserts also feature rare Autograph versions. Similar to last year, a special Asian Edition of the product will include several exclusives that are not found anywhere else. 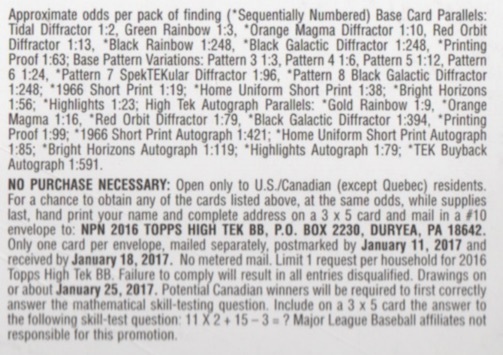 Every Asian box features an exclusive Gold Rainbow (#'d) base parallel. 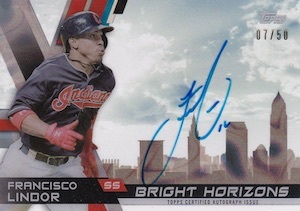 Collectors can also find limited Sky Rainbow (#/20) parallels for the High Tek Autographs. 2016 Topps High Tek Baseball Asia Edition is available through GTS Distribution. 111 cards. Detailed guide and gallery for the base patterns. PARALLEL CARDS: Tidal Diffractor, Red Orbit Diffractor, Gold Rainbow #'d (Asia only), Green Rainbow #/99, Orange Magma Diffractor #/25 (Hobby), Black Rainbow 1/1, Black Galactic Diffractor 1/1, Printing Proofs 1/1. PARALLEL CARDS: Tidal Diffractor, Gold Rainbow #/50, Orange Magma Diffractor #/25, Sky Rainbow #/20 (Asia only), Red Orbit Diffractor #/5, Black Galactic Diffractor 1/1, Printing Proofs 1/1. Good: Cards look great, the different designs really pop, inserts are distinct, on-card signatures. Bad: Still pricey for eight cards per box, inserts are tough to pull so normally just base and patterns in each box, can be confusing to make sense of what you pulled. 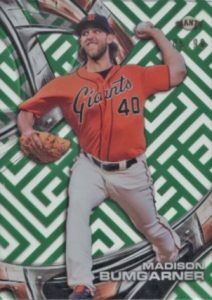 The Bottom Line: A nice reminder of the over-the-top nature of the 1990s, to me, 2016 Topps High Tek Baseball walks the line of too much of a good thing. While the unique look and quality design is refreshing in a hobby filled with mostly rehashed designs and concepts, the set asks a lot for what it delivers and the ambiguity as far as pattern rarity can be frustrating. Compared to 2015, the 2016 design puts more emphasis on the background pattern with the removal of the CGI explosion found directly behind the player on all the previous year’s cards. While this more simple take might be too plain for some, I personally liked it better. There is something abstract in the top-left corner this year but it is very subtle. I admit that the patterns don’t do much for me from a collecting perspective but they do make for a nice variety of choices, especially for player collectors. It’s still the same card and image but the background changes with varying rarity. Given they are essentially just parallels, I don’t see the need for all the games with which player falls into what group and resulting confusion. Obviously the on-card autograph aspect is huge and expected. Tek with stickers would be a massive letdown. While they aren’t all winners for me, the inserts are each very unique while still sticking to the acetate stock. My favorite is easily the Bright Horizons. The only downside is that they are all very tough to pull with 1:19 average box odds just to find one. Mixing current and former players, the base checklist is fairly comprehensive and likely appeals greatly to the various collectors who see their PC player covered. As far as set collectors, this is a much more difficult task given the format of just eight cards per box. 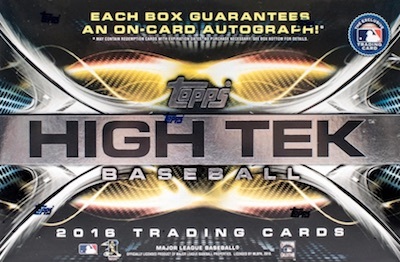 Another big element for 2016 Topps High Tek Baseball is the autograph checklist that delivers one card per box. These too feature old and new players but the group is not as strong from top to bottom and prices reflect this for many of the options. 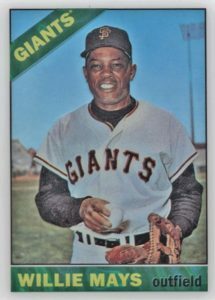 Falling in the $55-65 box range at the time of this review, the value at this price is tougher for one autograph and seven other cards that are going to be mostly base and parallels. 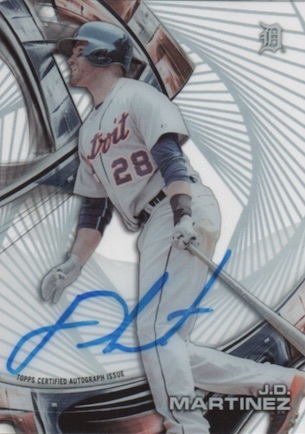 Of course, a rare pattern or parallel can help value just like a big-name autograph can boost a box. From a collecting value standpoint, I would like more cards per box, even if they are just the main base. As far as monetary value, the autograph checklist could be tighter and the price is still higher than it should be. I find the High Tek cards to be very impressive in-hand but I still think the price or format needs a tweak. A multi-pack format that still offers a guaranteed autograph at a slightly higher price or cutting down the cost for the current format would be ideal. 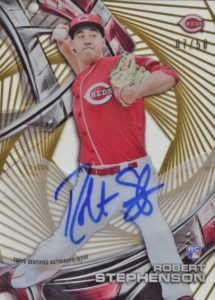 2016 Topps High Tek Baseball is a fun product. It really does stand out in a market that can feel very bland at times. However, I did find myself looking at the pack contents and feeling disappointment that there wasn’t more to it. Again, this is just me, but the confusion/mystery around the cards is more annoying than exciting. Numbering the cards would be nice even if it is just to note the pattern number on the back so the rarity is easily determined. So Pattern 2 would have a 2 on the back and so on. Putting firm print runs would be even better but I get that much of the hype is built around the unknown short print element. I love Tek! I can’t wait for these to come out. 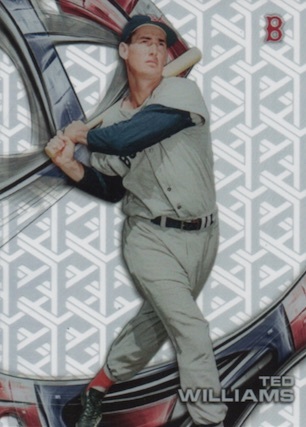 Any idea what the parallels /3 are called? I cant find any info on them anywhere. I saw multiple base cards #d /3 and it looks like the Tidal Difractor but with a different background. Products been live for 2 days now and still no Kenta Maeda auto to be seen. Mistake on the checklist? nice looking cards – but what’s the deal with the “red orbit” cards. supposed to be numbered /5 but I have 2 now – both un-numbered. What gives? I opened one box of this and was very disappointed with it. The cards look nice but there is no value in this product based on the box I opened. 6 base cards, 1 parallel tidal refractor and 1 auto that may be worth $5… not saying all boxes will be like this but I’ll gladly spend my money on other products. I absolutely love this product. All of the different variations, the on card autographs, and the durability. I still prefer cardboard “cards” but having sets like this that can retain a certain quality level easier is nice from time to time. Richard B. – you’ve probably already found this out, but the non-auto reds are un-numbered but the printing run still seems to be 5 (Ssp). Why they decided to number the red autos and not the non-autos is beyond me. I personally wish they would have numbered them. If anyone locates/has a non-auto red for Griffey Jr. and is will to sell it, reply to me and we’ll see if a deal can be made!